The British government has formally triggered Article 50 of the Lisbon Treaty to sound the starting gun of Brexit negotiations. While scheduled to last just two years, the actual negotiation time will be far less. The EU won’t agree its position until an April 29 EU leaders summit with the first face to face discussions possibly not happening until June. 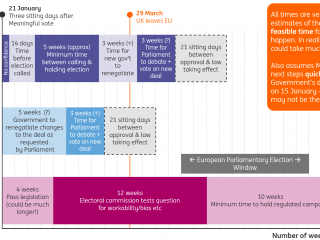 This means that two of Article 50’s 24 months will already have gone while another 4-5 months at the end will be eaten up as national parliaments vote on the deal. With Canada’s CETA trade deal with the EU having taken seven years to negotiate we think the British government is overly optimistic in thinking that both the divorce and the new agreement can be settled within such a tight time frame. As such, we believe a transitional arrangement will be required to minimise the “cliff edge” risk. The UK is keen to secure a transition period early on in the negotiations to reduce uncertainty for businesses. But the EU has suggested that such an arrangement can only be agreed once negotiations on issues such as exit costs are completed, and that the transitional period should not exceed three years. One of the biggest obstacle to getting a UK-EU deal as we currently see it is Italian elections (expected early 2018) where three of the four largest parties could fight an anti-euro ticket. This leaves the potential for a government to be formed that pushes for its own referendum on euro/EU membership, even though this would first require a change of the constitution. The implication is that the EU negotiators might be inclined to take an even tougher line in Brexit negotiations to make leaving look as unattractive as possible in an act of EU self-preservation. Nonetheless, we remain optimistic that a mutually beneficial deal can be struck. The volume of trade that is conducted between the EU and the UK combined with the UK’s willingness to make financial contributions to the EU budget offer hope that the decision will be “economically rational” as PM Theresa May put it. In terms of our economic forecasts, we have largely left our growth predictions unchanged this month, but have revised up our near-term inflation forecast a touch to reflect the recent above expectations run of numbers. Having said that, we still think inflation is unlikely to rise much above 3% YoY. After all, sterling has stabilised and we aren’t seeing the surge in commodity prices and the hikes in Value Added Tax rates that led to inflation peaking above 5% in 2008 and 2011. This acceleration in inflation has led the Bank of England to strike a more hawkish tone with the March MPC meeting seeing one member vote for an immediate rate hike. Kristin Forbes justified her decision by arguing that inflation “was rising quickly and was likely to remain above target for at least three years”, while “the weakness in activity expected since the referendum had not materialised”. The minutes to the meeting hinted that she might be joined by a couple of other MPC members soon. It warned that “with inflation rising sharply, and only mixed evidence on slowing activity domestically, some members noted that would take relatively little further upside news on the prospects for activity or inflation for them to consider that a more immediate reduction in policy support might be warranted”. We remain of the view that an interest rate increase is unlikely before Brexit is concluded. For one thing, Kristin Forbes is leaving the MPC at the end of June, which will make building a consensus for a hike more challenging. Then there are the clear disagreements within the MPC with Deputy Governor Ben Broadbent arguing in a recent speech that there is no material evidence of domestic inflation pressures. More significantly we continue to think that the UK will lose momentum through 2017 and into 2018 with annual GDP growth slowing from 1.8% to 1.2%. While price inflation is rising sharply we are not seeing a response from wages (both currently rising 2.3%), meaning that household spending power is being squeezed. At the same time businesses are becoming more cautious due to the uncertainty of the Brexit negotiations with surveys pointing to a slowdown in hiring and investment. On the positive side, a more competitive exchange rate should help net trade, but on balance we don’t think this is going to be enough to offset the weakness in domestic demand. This below trend growth should in itself help to dampen medium term price pressures. As a result, we agree with the market pricing in just a 40% chance of higher interest rates this year. Brexit update: Theresa May’s biggest test yet? What now for the pound and Brexit as May faces a no-confidence vote? Brexit blog: Just how close is a deal?